When brand new and highly polished, pewter looks very much like silver, and many pewterers stamped pseudo-hallmarks on their wares to mimic the officially-approved hallmarks on silver. They can’t have been trying to deceive their customers as they would have known perfectly well what they were buying. It is more likely that the customers wanted the hallmarks so they their visitors would think they were wealthy enough to afford silver! Whilst hallmarks on pewter have no official significance, they can help identify the pewterer. There are normally four hallmarks, but pewterers from Wigan often used five, whilst very occasionally other pewterers used two, three or six. 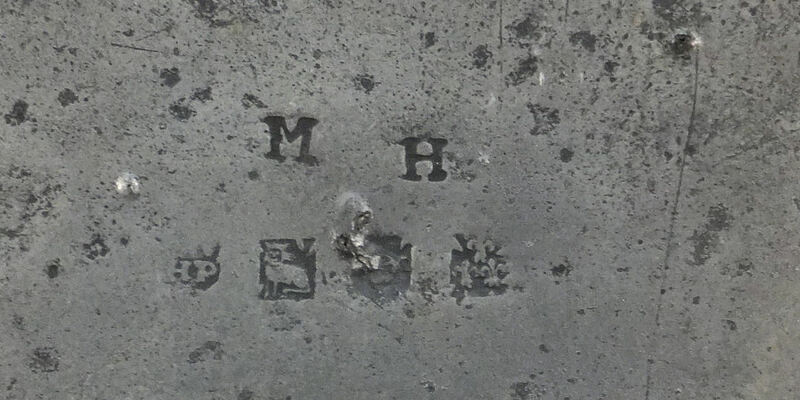 The hallmarks often include the pewterer’s initials. Sometimes all the hallmarks are the same. Hallmarks were not used prior to about 1630. With plates, dishes and chargers the position of the hallmarks can help with dating. They were normally on the front of the rim up to about 1730, and thereafter on the back of the well. Dutch and American pewterers also used pseudo-hallmarks, so the presence of hallmarks is not conclusive evidence that the piece is British.